Thermocompressors in the food processing industry. Thermal recompression, or thermocompression, is a process by which a portion of the steam discharged from an evaporator effect is captured and compressed to a higher pressure and temperature for reuse. This is accomplished by a thermocompressor which entrains and compresses low-pressure spent steam for reuse at a higher pressure in the initial effect of a multiple-effect evaporator. A thermocompressor operates the same principle as a steam jet ejector used for producing a vacuum. Thermocompression helps the Food Processing Industry in its growing effort to conserve energy, a process that can save more than one-third of the steam and water required in a similar capacity evaporator system not using thermocompressors. 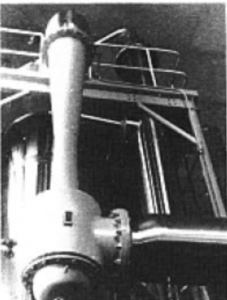 In this process a portion of the steam discharged from an evaporator effect is captured and compressed to a higher pressure and temperature for reuse. Croll Reynolds thermocompressors consist of three basic parts: nozzle, mixing chamber, and diffuser. These sections function passively to entrain and compress a low-pressure fluid, such as spent steam, to some higher pressure. The recompressed fluid can then be used elsewhere, and its heat reclaimed. In the Food Processing Industry, product sensitivity dictates low evaporating temperatures; hence, the entire system operates under vacuum. As the Food Processing Industry continues its drive to reduce fuel costs and improve product quality, more plants will switch to multiple-effect evaporation systems. For these new systems, as well as for existing multiple-effect evaporators that can be retrofitted with thermocompressors, thermal recompression is a practical method for reducing over-all production costs.